My dog, Max, is an escape artist. We have a wooden privacy fence in the back yard, which he has no qualms about digging under, and a front door that we use frequently — perfect for squeezing out of whenever my hands are full. Whenever he makes his escape, he runs straight into the woods by my house and stays there for about an hour, probably tracking deer and enjoying the assault of new smells. Eventually, he walks home. He sits at the front door and barks until someone lets him in, and then he struts around the house like a king for the rest of the day because he was able to pull one over on us. Those days are coming to an end, my friend. We’re installing an invisible fence. Finally. When we made this decision, we thought it was a plain and simple option, but it turns out we have more choice than we’d thought. There are two types of invisible fences, in-ground and wireless. And while they both operate under the same principal — keeping your dog in your yard by means of electric containment — the two are actually very different. Which type you choose has a lot to do with your house, your lifestyle and your dog. In-ground invisible fences are pretty much what you picture when you think of an invisible fence. An electrical line is buried around the perimeter of your yard (or the area you want your dog to have access to), and your dog wears a collar that is connected to the line by a signal. As your dog approaches the fence, he receives a warning through either a sound or a static correction, a mild, harmless electric current meant to get his attention. As he gets closer, the warning gets stronger, which encourages your dog to stay clear of his boundaries. In-ground fences are labor-intensive to install and can be pricey, depending on the size of your yard. However, they give your dog a clear boundary and can also be used around pools, fountains, gardens and other off-limits areas. Wireless invisible fences are much simpler than their in-ground counterpart. With a wireless fence, you only have a transmitter and its corresponding collar. You set a boundary area by distance, and your dog is allowed to travel that distance from wherever the transmitter is located. 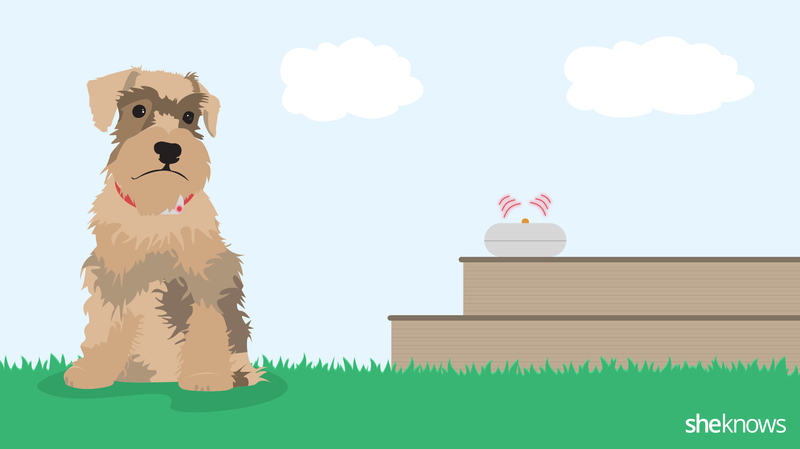 The area is adjustable, so you can give your dog more room to roam on one day than the next, but the area will always be a round boundary with the transmitter serving as the center. If you have a very large yard this may not be an problem, since you can still give your dog a large circle in which to travel. If, however, you live in a city with a smaller yard, like I do, this could create an issue. Creating a circle that doesn’t go over any of my property boundaries actually gives my poor dog a pretty small area to work with. On the upside, these transmitters are portable, so you can take them on trips and may find them useful if you rent or move frequently. Also, they set up in minutes, so you save tons of time and money on labor. There are some important things to keep in mind before you decide an invisible fence is the right choice for you. Check with your vet to make sure it’s a safe choice for your dog’s size, health and breed. Although an invisible fence will work well to keep your dog in, it’s completely useless at keeping other animals out — something that could affect the safety of your dog. With any invisible fence, check all batteries on all devices and transmitters every few months. If the batteries don’t work, your dog is not restricted. Depending on the type of device you choose, your fence may stop working in a power outage. No invisible fence will work right away with your dog. There is some training required for your dog to learn his limits and what happens if he gets too close. Some companies include a dog trainer as a part of the package, but cheaper options will leave you to do the training yourself. I still think an invisible fence is a great option for my frequently disappearing dog. Yes, it does deliver a small shock, but if that’s what I need to do to keep my dog from wandering into the woods or a busy street, that’s fine with me. In the end, I chose to install the in-ground option because it will work better for my property size and shape. I’m not looking forward to the setup and training process, but I’m really excited to not have to worry about our precious pup taking off.